Preheat oven to 200 degrees. On a baking sheet, arrange flatbreads in a single layer and place in oven to warm. In a medium skillet, heat 2 tablespoons butter until foaming. Add peppers, onions, and ham; cook until vegetables have softened, approx. 3 minutes. Transfer to a bowl and wipe out skillet. Meanwhile, whisk eggs, salt, and pepper in a large bowl. Melt remaining butter in a skillet over medium heat until foaming. Add eggs and gently stir until the eggs have set, approx. 2–3 minutes. To assemble wraps, remove warmed flatbread from oven. 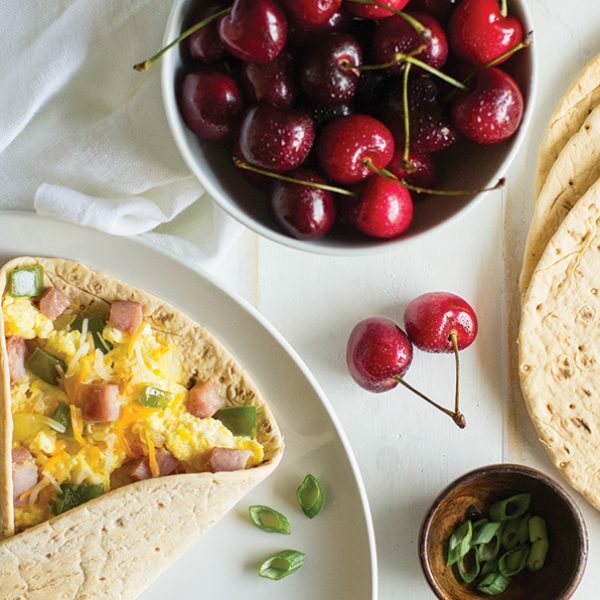 Divide the scrambled eggs and ham mixture among all flatbreads. Top each wrap with 2 tablespoons shredded cheese. Roll and slice in half to serve.